Until now, we’ve died. Until now. In 1865, Ireland is still numb from the Great Famine that killed a million people and drove as many out of their cherished island. Unspeakable grief and starvation weighed on Irish people’s spirit for decades afterward. 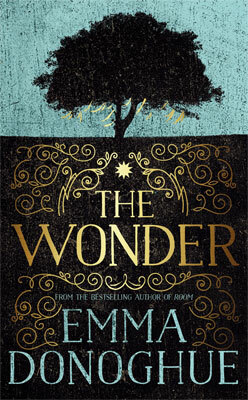 Emma Donoghue’s new novel, The Wonder, depicts the after-effect of these abominable seven years: a desperate need for hope or—as Dr. McBrearty expresses it more specifically in the book—an extravagant dream for the “freedom from need” and the “possibility for life to endure without food”. The main characters is a nurse called Elizabeth Wright, or Lib. She was summoned all the way from England to observe Anna O’Donnell, an eleven-year-old girl who has allegedly lived without food for four months. Lib was trained by the famous Florence Nightingale and represents modernity and expertise in the field of nursing. She is trusted to confirm or disprove Anna’s fast. At its core, The Wonder is a mystery: is Anna a fraud? If she is, how is she pulling it off? And why? If not, is she an angel, as her parents insist, or a natural phenomenon, as her physician argues? The English nurse acts as a detective, taking all kind of measurements of Anna, searching every corner of her home for a food stash, and monitoring the family members constantly to unmask an artifice. She digs into the history of the O’Donnell and of the whole village to understand the context of Anna’s fast. She also talks to the child’s physician and priest to get some perspective on Anna’s case. Immediately convinced of a subterfuge, she not only sets herself to expose Anna’s stratagem, but also the deep motives behind it. Her frantic researches and inquisitive mindset push the story forward at a fast pace, with an incredible suspense that is sure to keep the reader riveted. However, Lib progressively realizes that the situation is much more complicated than expected. Anna’s case can’t be appreciated without an understanding of Ireland’s culture, religion, history and mentality. This is one of my favourite aspect of The Wonder: on the one hand, Anna’s story is very intimate and particular to this one child; on the other hand, her extraordinary case is a symbol of 1865’s Ireland, devoured by fatalism and devoted to God with complete abandon. Considered an “angel” by her fervently Catholic parents, and a “hope for the whole human race” by her physician, Anna is definitely a symbol of resilience and strength in a country plagued by hunger. In this respect, Lib is a brilliant main character: as an outsider herself, she allows the (non Irish) reader to share a candid position towards Irish beliefs and customs. Through her, we discover all aspects of the O’Donnell’s life, from the beautiful yet treacherous bogs surrounding their house, to the eerie omnipresence of fairies and the many rituals to keep them away, to the minute details of their everyday life, such as cooking and praying. Furthermore, I liked that Lib was able to acknowledge her mistakes and grow through her experience at the O’Donnell’s despite her being a very strong and opinionated woman. However, my favourite aspect of The Wonder is maybe its creepiness. Although Anna is supposed to be the incarnation of Hope, you can’t miss the fact that she is standing on a mass grave. The spectrum of starvation, death and hopelessness are everywhere in The Wonder: families begging for food in the first pages, a missing son in the family, corpses swallowed by the bog during the construction of a pointless road, a tree covered in rags representing wishes… Everywhere, grief and defeat. Besides, The Wonder shares a claustrophobic dimension with Room, the previous award winning novel by Donoghue. Despite Anna’s relative freedom, she spends most of her time in her minuscule and bare room, whose walls are made of mud and hair and even blood. It’s dark and filled with Anna’s obsession for religious cards, trinkets and constant prayers, several times an hour. Although seemingly free from the need to eat—Ireland’s number one concern—Anna appears trapped: recluse in her room, tied to the secrets of her family, stuck in her understanding of Catholicism and in her own obsessive behaviour. I found this contrast—the blind enthusiasm for Anna’s case despite the obvious darkness surrounding it—really striking and beautifully rendered by Donoghue’s writing. Overall, I must admit that I enjoyed The Wonder even more than I did Room. Not only the mystery behind Anna kept me entirely riveted from page one, but I really enjoyed the complete immersion in the Ireland of 1865. I felt right there, peeking into the O’Donnell home, witnessing their everyday life, cooking, cleaning, praying, and keeping the fairies away. It led me to read further about the Great Famine and its causes, as well as the Irish folklore. I also deeply cared for the characters in the book and really enjoyed the dynamic between them, especially how Lib and Anna challenge one another’s beliefs. Finally, I loved the mystery and the unexpected way it unfolded. The Wonder was a captivating and surprising story wrapped in darkness but also humanity. I loved the historical aspect of this book – the whole idea behind the ‘fasting girls’, and the way science, religion, and culture all come into it. Glad you liked it so much! The Wonder and Room are so different, it’s hard to say which I like more, but probably this one.